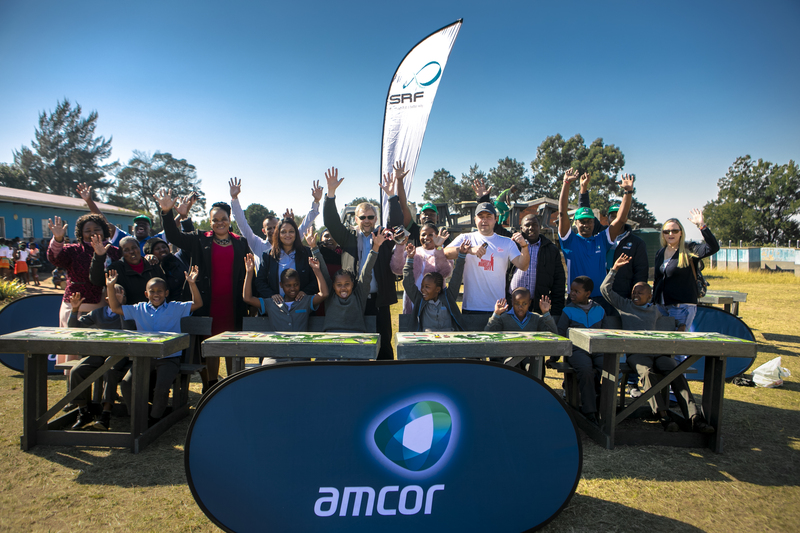 In the true spirit of Mandela, WILDLANDS together with its partners Amcor, Pepsico and SRF FLEXIPAK handed over 100 Green Desks to underprivileged schools in KwaZulu-Natal (KZN) and Cape Town in the Western Cape last week. 50 of the Green Desks were donated to Emngcwini Primary School located in the Cato Ridge community in KZN. The school has 215 learners (between the grades of Grade R to Grade 7), who mainly come from unemployed homes or are orphans. Through the funds received from the Department of Education, the school provides one full meal per child per day as well as provides the necessary extra curriculum activities like netball, soccer and athletics as well as enter the learners in Spelling Bee and Museum Schools Competitions. Another 50 Green Desks were donated to Uitsig Primary School in the Cape Flats – Ravensmeade Community. This community is ravaged by gangsterism and drugs, this donation brought a glimmer of hope for the future of the learners in this community. “The impact of these desks is two-fold. Not only will these 100 desks prevent 5 000 kgs of multi-layered multi-film plastics from going to landfill, but the difference on the quality of education for the 200 learners who will, quite possibly, have a desk for the first time in their lives, will be remarkable. It is estimated that a learner can experience up to a 20% increase in grades as a consequence of working on a desk. Our thanks to Amcor, Pepsico and SFR FlexipakSA for making this donation possible,” concludes Louise Duys, WILDTRUST Director of Marketing, Partnerships and Events.